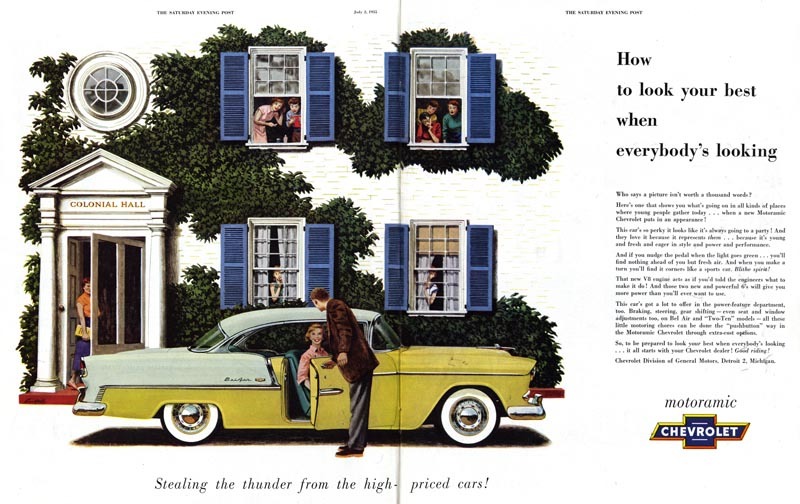 Today I'm happy to play a supporting role to Charlie Allen as he discusses his experiences doing automotive illustrations for Chevy during the 1950's. Charlie mentions several other west coast artists with whom he worked on the Chevy account at Patterson & Hall in San Francisco. ... and although I didn't have an actual auto illustration by Dan Romano handy, at least this excellent line drawing, supplied by Charlie, was done for the Chevy account. One other 'west coaster' Charlie didn't mention is Jimmy Hansen -- and I'm not sure if he actually worked on the Chevy account. 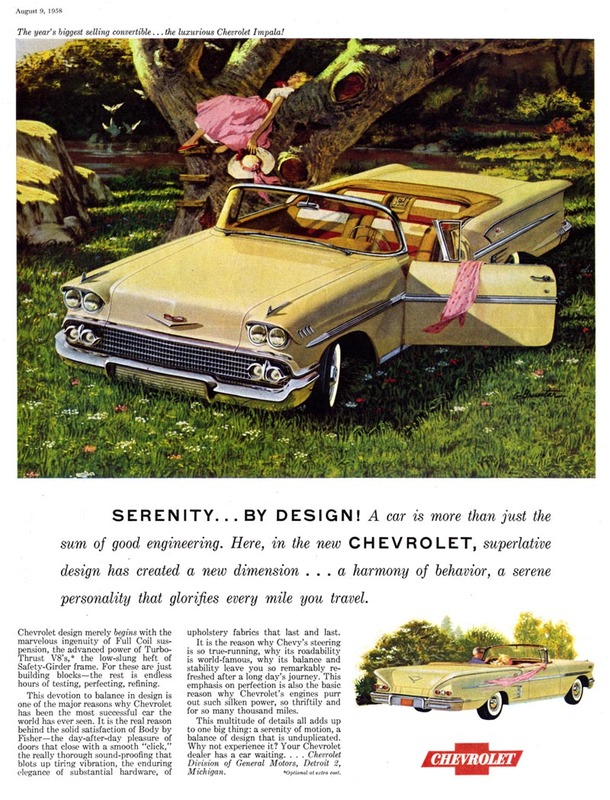 But I know Charlie will be happy to see this beautiful piece Hansen did for GM in 1959. And what about Chas. Allen himself? You'll have to visit Charlie Allen's blog (go right now!) to see some stunning examples of his own efforts on the Chevy account. If there was ever any doubt, the pieces Charlie shares with us this week are proof that he is a living master of the inked line - be sure to tell him you think so, too! * This is a good time for me to point you toward both Harry Borgman's blog and Jim Bernardin's blog. 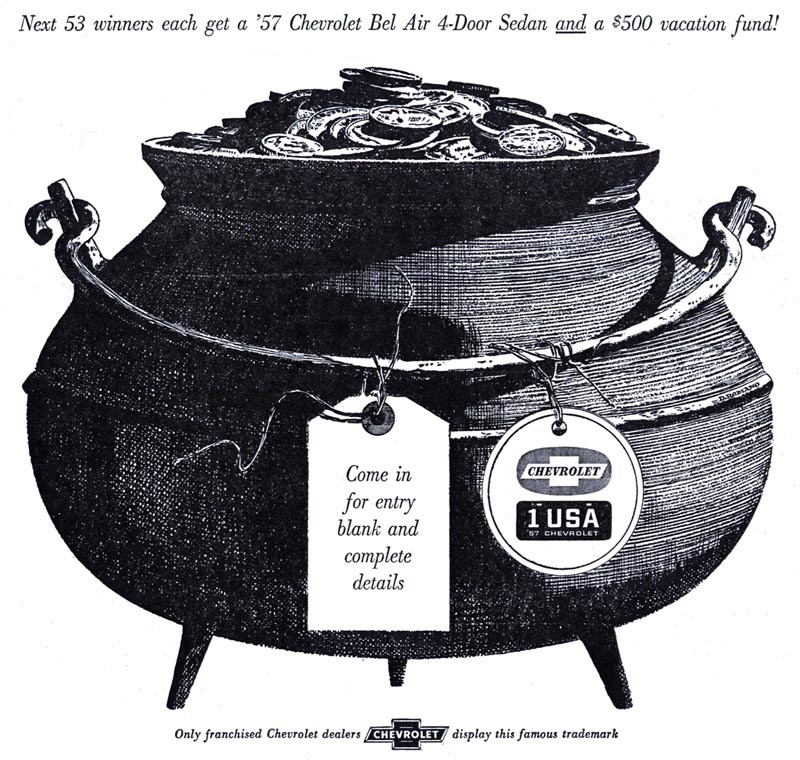 At both sites you'll be able to read about and see many wonderful examples of what was going on with the Chevy account back east in the Motor City. Leif, you are rapidly becoming the world's greatest expert on mid-20th century automotive art. Today the most valuable asset of the now defunct Saturday Evening Post is the royalties that its successor collects for the use of those beautiful illustrations. 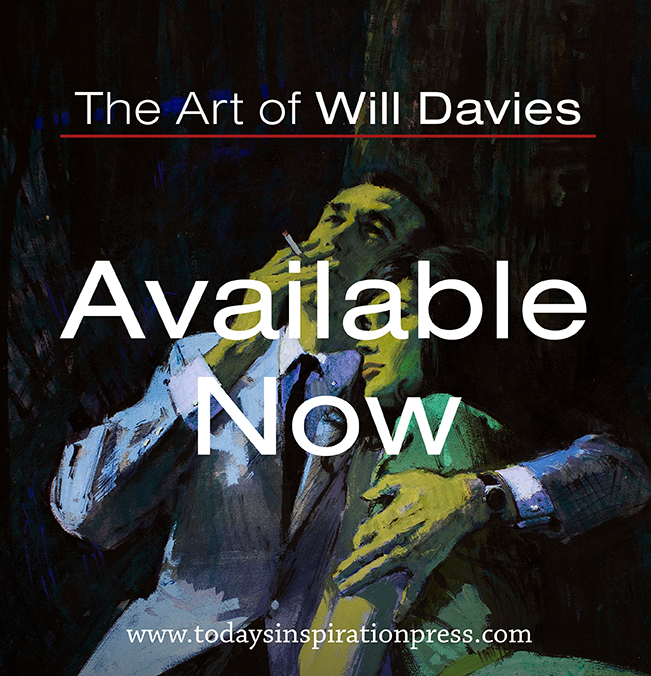 Who would have thought when they were commissioning all those beautiful pictures over the years as an adornment to the magazine that the pictures would be the only thing that would last, and in fact increase in value? Some day in the near future, when GM, Ford and Chrysler have all gone bankrupt, they are going to wish they held onto those illustrations by Ludekens and others. They will be more valuable than the crumbling buildings and idle assembly lines! Leif, ya gotta write a book. David is right. Another name to add would be Chris Kenyon, who is still alive and living in Albion, Ca. He was one of my teachers, great fellow with stories to tell. 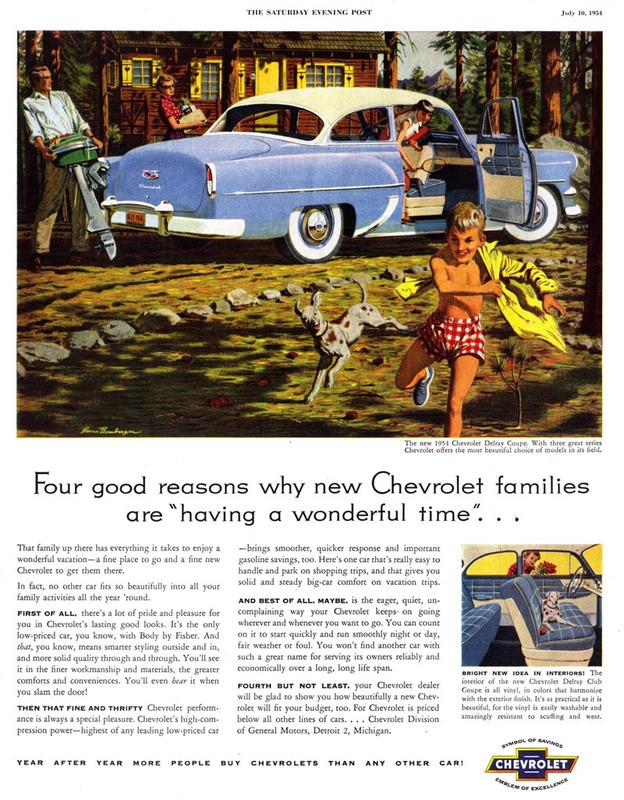 P.S.,Looking at the Chevy ad with the family having fun by the lake, ever wonder why dad appears to be attaching a motor boat motor to the bumper? Man! They really built great cars back then! Amphibious, even! Leif, a great post. 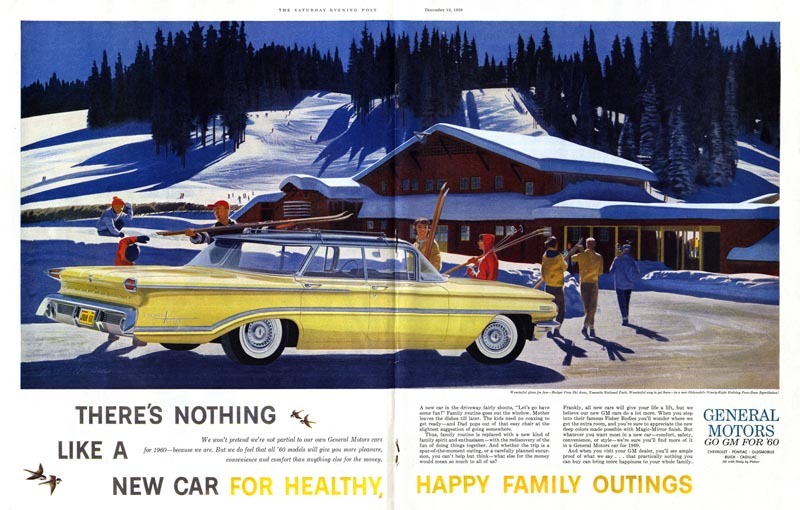 I don't recall Jim Hansen illustrating any Chevy ads, however I do remember seeing a few great Chevy billboards that he did. 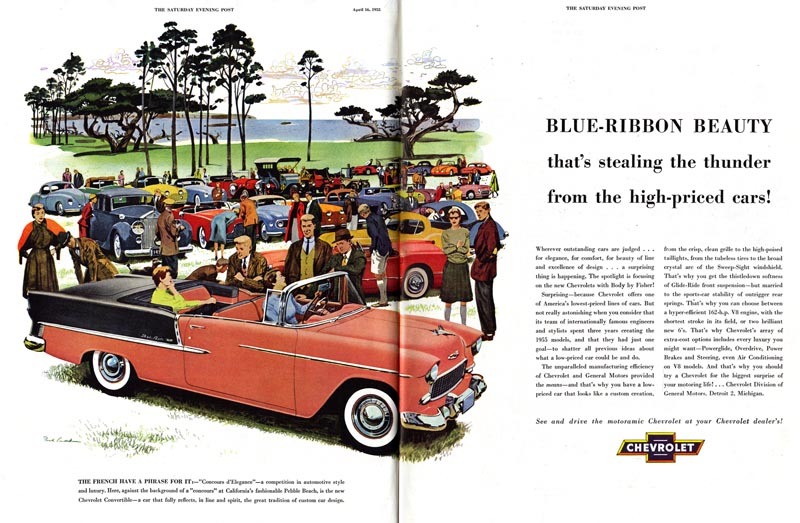 I'll check with Jim Bernardin, he may have some photos that can post on his ABOUT OLD CHEVY ADS blog. I've been looking for automotive art like this for a long time. I recently started collecting a few pieces and was looking for a website where I could browse and order some. Any ideas, besides something like eBay?